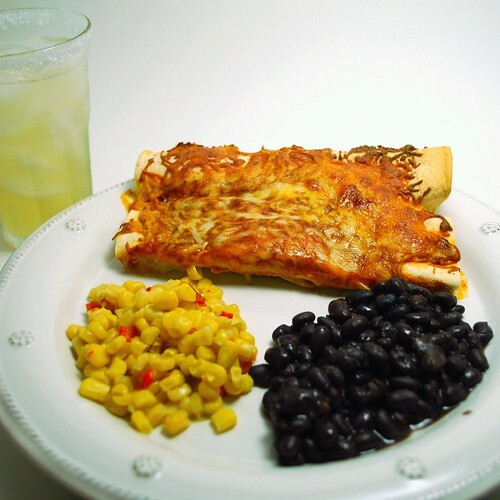 This is one of our favorite meals – it’s a fabulous fiesta! 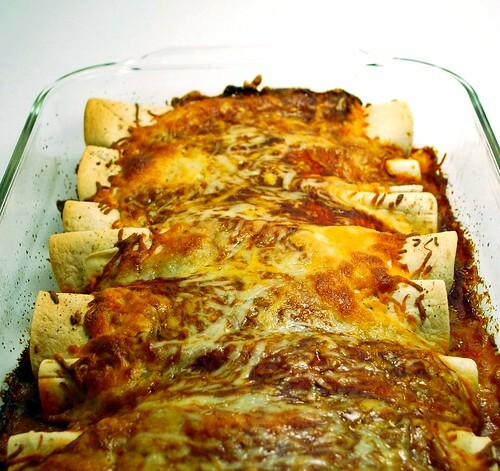 These enchiladas are so easy, but full of flavor. The perfect balance of spices and cheese, they are perfect for a weeknight meal or for a festive Cinco de Mayo party. Grease a 9×13 -inch baking dish, and preheat your oven to 375 degrees. In a large bowl, combine the shredded chicken, sour cream, cheese dip, shredded cheese, green chilies, fajita seasoning, red pepper flake, pepper, Tabasco, and cilantro – until thoroughly mixed. Take tortillas, one at a time, and fill with about 1/2 cup of the chicken mixture. Roll the tortilla up, and place the enchilada, seam-side-down, in the prepared baking dish. Pour the enchilada sauce over the top, like so . . .
Bake for 20 minutes, until sauce is bubbly and tortillas begin to turn golden. Remove from the oven and sprinkle with the second 1/2 cup of shredded cheese. Return to the oven for 5-10 minutes, until cheese is melty and caramelized. Serve with your favorite sides, and perhaps a margarita! Enjoy!